Cord MacIntosh, ex-Army and ex-mercenary, has retired to Florida where he now lives aboard a sailboat and has settled into a job as a private investigator. Life seems peaceful enough and he's even rediscovered religion — but some cases are more dangerous than others. 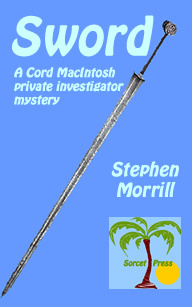 “Sword” is the first book in the Cord MacIntosh private investigator mystery series. Cord MacIntosh, private investigator, is hired to find a stolen sword that once belonged to a Spanish conquistador. Soon, though, the bodies start to pile up and Cord finds that archaeologists are every bit as greedy and vicious as anyone else. Now he needs to find the sword, find out who the killer is, and keep himself alive while doing so. 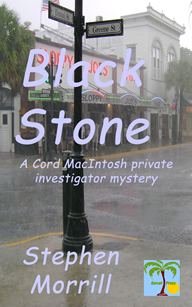 “Black Stone” is the second novel in the Cord MacIntosh private investigator mystery series. Cord MacIntosh, Private investigator, is hired to bodyguard Mahdi, an author whose book has offended 1.5 billion Muslims around the world, some of whom are set on killing the author. Cord wonders if he can keep Mahdi alive through a weekend writers conference in Key West. Then he starts to wonder if he can keep himself alive.